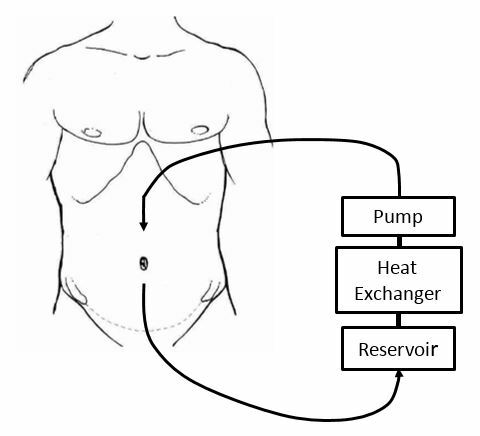 Hyperthermic Intraperitoneal Chemoperfusion (HIPEC) is a specialized treatment for certain abdominal tumors. The purpose of HIPEC treatment is to kill microscopic cancer cells invisible to the human eye and reduce cancer recurrence. HIPEC surgery combines removal of abdominal tumors with a single dose of chemotherapy warmed to 107 degrees and inserted directly into the abdominal cavity at the location of the tumor. The combination of heat and chemotherapy can kill cancer cells and prevent tumor recurrences. The medication does not cross into the bloodstream, which minimizes potential side effects and allows for a higher, more effective dose of chemotherapy than would be possible if given intravenously (IV). At the end of surgery, the chemotherapy is removed and the abdominal cavity is cleansed before the incision is closed. Because many of the tumor types treated by HIPEC are rare, it is not unusual for confusion, doubt and uncertainty to cloud the diagnosis and recommended treatment before seeing a HIPEC surgeon. Because UCLA is experienced in treating these rare diseases, we can diagnose and treat the condition while avoiding unnecessary tests and delays. Consultation Visit: Your surgeon will take a comprehensive history, perform a physical exam and review all laboratory, imaging and biopsy data. Your surgeon will ask for past diagnostic studies and treatments including endoscopies, MRI, CT or PET scans, and past surgical reports. We will answer your questions and, in partnership with your surgeon, create a personal treatment plan. Preoperative Preparation: If additional diagnostic studies are required, they will be scheduled at the consultation visit. If surgery is recommended, it is important for you to stay physically active and maintain good nutrition prior to surgery. This will significantly speed up your recovery. Surgery: Each HIPEC surgery is unique and depends on tumor size and location. The only tissue routinely removed, because it is the first place where tumors spread, is the omentum – a fatty “curtain” attached to the colon. Other abdominal organs attacked by the tumor are also removed. In certain cases, minimally invasive laparoscopic surgery with small incisions is possible. Once the visible tumor is removed, the HIPEC portion begins. This takes about two hours under sedation. Temporary tubes are placed in the abdomen to circulate the chemotherapy through the abdomen, fluid warmer and pump. Once complete, the chemotherapy is removed along with the temporary tubes and the incision is closed. Recovery: Depending on the procedure(s) needed to remove the abdominal tumor(s), most patients are discharged from the hospital in about seven days. Recovery continues at home and typically takes four to eight weeks. Follow-up: Your surgeon will schedule you for an outpatient follow-up visit about two weeks after you are discharged from the hospital. Many patients do not require IV chemotherapy after HIPEC surgery, however, decisions are made after reviewing final pathology results. Most patients undergo long-term follow-up by combining regular clinic visits, periodic imaging (CT or MRI) and laboratory tests.